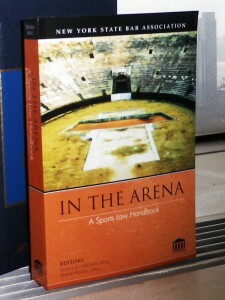 First published November 11, 2013, this post is based in part on part of my contribution on trademark law and the right of publicity in the New York State Bar Association publication, In the Arena. As with other posts on the blog where I have recycled revisited such material, it may sound a little bit less like a LIKELIHOOD OF CONFUSION® blog post and a little bit more book-like. In this case, however, the post is a significant expansion upon what appeared in the book. As seen in the Benny Goodman case in the TTAB, celebrity, brand power and trademark rights may outlive a celebrity’s peak performing years, but will bear fruit only as long as the roots of the “brand” itself—the image, sensibility or other association the celebrity name elicits—remains alive. How does a brand stay alive after the celebrity’s career (much less his life) are over? 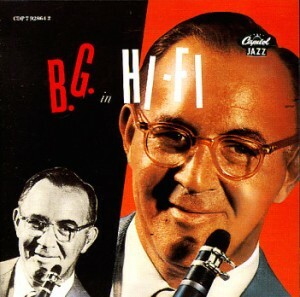 For insight into the answer, consider the management of the BENNY GOODMAN trademark, where one significant basis for the TTAB’s ruling against the seemingly bona fide applicant was the finding that a corporate successor in interest was actively exploiting the late King of Swing’s fame. In contrast, the custodian of the intellectual property rights bequeathed by Goodman’s contemporary and colleague, the great band leader Glenn Miller, managed to completely squander those rights. Miller died tragically in 1944, and decades of internecine squabbles among his heirs followed. 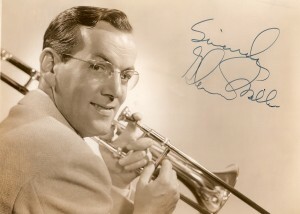 Finally, in 2006 the Ninth Circuit essentially declared the “Glenn Miller” and “Glenn Miller Orchestra” trademarks dead as well, affirming the district court’s ruling that decades of inaction by the plaintiff, despite knowledge of the defendant’s infringement, amounted to a fatal case of laches. The lessons of these cases for advising celebrities are obvious: Lawyers must ensure that a star’s brand does not die with him — or with his playing career. An athlete’s planning for post-career continuation of the brand should begin early. Few athletic careers extend past age 40, and most end far earlier. Absent proper brand management, a sports star’s trademark rights may wither and die well before he does. This need not be the case. Endorsement power can live and grow well past the active playing life of a professional athlete. There is no better example than the extraordinary post-play branding career of golfing legend Arnold Palmer, who unlike Miller and Goodman didn’t lead the perfect band but arguably developed, and exploited, the perfect brand. 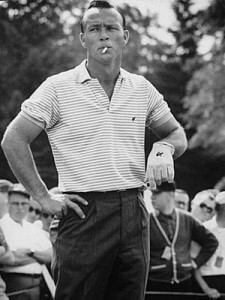 Arnie is very much alive, but his competitive golfing days are well behind him. Yet he has made far more after the peak of his glory days than he ever did on the green. The country produces superb athletes regularly, of course, and the 1960s have seen many of them—Jim Brown, John Unitas, Willie Mays, Sandy Koufax, Mickey Mantle—but none can rival Palmer. Not only has he reached a celebrity status enjoyed by few individuals in any field, he is the first athlete to become a walking million-dollar corporation in his prime. . . .
By Tuesday afternoon the filming is done. Arnold hurries to La Guardia and flies in his jet to Shawnee, Pa. to participate in the grand opening of a food-processing plant built by his father-in-law, Martin Walzer. He spends the night in Shawnee. The next morning he flies back to New York City, where he picks up four top business executives as part of his association with the U.S. Banknote Corporation. He flies them to Latrobe for a VIP day of golf, meals and drinks at Laurel Valley Golf Club. On Thursday he poses for photographs again, this time for the Bolens Division of FMC, for whom he endorses lawn equipment and snowplows. Two days in Latrobe follow, but on Sunday he is off once more, this time to Winchester, Ky., where he is made a Kentucky Colonel and an Admiral of the Kentucky Waterways. He plays an exhibition there and is back in Latrobe by nightfall. Monday and Tuesday are Arnold Palmer Enterprises days in Latrobe, as 14 executives from his various corporations fly in to consult, dine and play golf with the boss. Meanwhile Tuesday has brought an unexpected problem. The State Department called both Arnold and me on a matter of some importance. General Ne Win, the Burmese strong man who only a year ago was contemptuously cutting off American aid and throwing out American businessmen, has suddenly decided to visit Washington. Two things are known about him. He is on an intense neutrality campaign and he is an avid 10-handicapper. President Johnson wonders if Arnold could come to meet the general on Thursday, Sept. 8. Unfortunately, there is no way to postpone an exhibition match in Wilmington, Del. scheduled for the same day, and Arnold has to decline. A State Department spokesman accepts his regrets but urges him at the same time to try to schedule a proposed exhibition tour to Thailand, Cambodia and Malaysia. The U.S. Ambassador to Malaysia now calls, suggesting that the trip be made as soon as possible. So does Senator George Murphy, who some weeks earlier had joined Senator Stuart Symington at a breakfast with Arnold to discuss the trip. It is felt that U.S. relations would be much helped if Arnold made such a tour—many influential people in these countries are golfers. How uncomplicated, I think to myself, the job of representing a golfer must have been back when only golf was involved. Despite retiring from competitive golf in 2006, Palmer still earned $25 million from sponsors like Callaway, Rayovac and Rolex. . . . 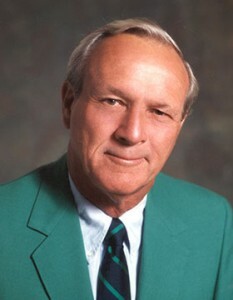 Consideration of Palmer’s success reveals a genius for enterprise, which coupled with his famous charisma is so compelling that his example arguably “proves too much.” It is instructive nonetheless; many star athletes with a tenth of Palmer’s on-the-green talent would be happy with a twentieth of the fortune he has amassed from his brilliant exploitation of the “Arnie” brand. I got to thinking: is “Arnold Palmer” generic for beverage that is half iced tea, half lemonade? I don’t know. I have hear many people order “Arnold Palmers” in restaurants and the servers know just what they want – half iced tea, half lemonade. Is anyone infringing a trademark in that situation? The Arnold Palmer signature is registered for beverages. U.S. Reg. No. 2161853. Mr. Palmer appears to have licensed the name (or the logo?) to AriZona Beverage Company [see right]. The drink has its own Wikipedia page here. If another party uses the name, but not the signature, to identify a beverage are they infringing the mark? 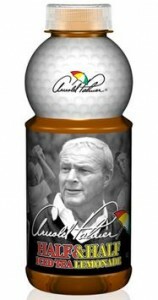 How strong is the mark if it has been called an “Arnold Palmer” by many for years and years? Is it a mark at all? I don’t have the answers to these complicated questions, but I like raising them. [Is] the mark enforceable? Ten years ago, Mark Dowey and his two friends in the dairy business were sitting in a country club dining room when one of them ordered an Arnold Palmer, the half lemonade, half iced tea drink combination made famous by the golfing legend. Up untl that point, Palmer — whose connection to the drink goes back to the late 1960’s when he was reportedly overheard ordering the drink in a restaurant — had not capitalized on it. Knowing this, the three decided it would make sense to draw up a business plan — on a napkin of course — and present it to Palmer’s agents at IMG. IMG soon granted the rights for Arnold Palmer tea to Dowey’s company, Innovative Flavors, who would search for the perfect partner to make the product. As part of the process, the business team surrounding the now 80-year-old golfer trademarked his name associated with the product. They found that partner in AriZona Beverage Company and the rest is history. The Arnold Palmer Light Half & Half was born. The product has been on the market for 10 years and Dowey says that the business has doubled every year. This year , the brand is on pace to hit $100 million in sales . . .
Whatever “rights” Arnie granted, he doesn’t seem to have gone wrong. Arnie’s gold-standard success, placed in relief against the lost opportunities demonstrated by the heirs to the Glenn Miller rights, demonstrate that while planning for brand protection and exploitation should be undertaken when a player is at the peak of his or her career and has maximum negotiating power, a well-managed celebrity brand can even work its way out of the IP rough and snag that “green” jacket.